In the 8th at Delaware, Benny’s Diamond “broke down” and can safely be presumed dead. The filly was raced just nine days prior at Parx, where she finished dead-last, 16+ lengths back. In other words, her “breakdown” should come as no surprise. Might you comment as well? One “jerk” doesn’t care about 24 horses killed per week, and is a name-caller . . .
Those in the industry get quite nasty, when faced with the truth. I’ve been the brunt of such a few times. But I will tell you this…if name calling, and rude, disgusting comments are all they have to counter with, when faced with the facts…well, that speaks volumes for the facts on hosreracingwrongs. Name calling and dirt throwing are used by those, that have nothing else to counter with. And there is no argument strong enough, to justify horse racing. One of their favorite weapons is character assassination. They did it to me, while I was in the business, and started speaking up about the ongoing cruelty. They do it to me now. They attacked my character such as: “your just a quitter,” “you were unsuccessful so you are bitter,” “you don’t deserve a Trainer’s license when you say things like that.” etc etc. On this blog they called me a coward because I left. I thanked them for calling me unsuccessful because I could no longer participate in this cruelty circus, and death camp. I remember reading your post, about all that they did to you. The backlash from some is very real, and I feel it is also very dangerous. Here I post under 20yr+, and that is the way it will have to be. I tried the other way, of just saying things…it didn’t go so well. Hey Lucy…thank you for taking the time to comment on that particular pro-horse racing blog. I do believe there is some value in providing a brief statement in support of the horses – including mentioning the facts that Horseracing Wrongs provides for any readers that might be there searching for truths – but outside of that, I feel it is a waste of YOUR precious time to engage those who support the industry…remember this, Lucy…they are NOT our audience. And what I find time and time again is that they have nothing to come back with except for insults. I have been called so many things and have had lies told about me – I see it as a badge of honor – we are making an impact and the pro-racing camp has NOTHING to dispute the facts with so they hurl insults and resort to name calling. Less than admirable, for certain. But just keep sharing Horseracing Wrongs…the horses THANK YOU. Yes they have done things to me that nobody would believe. They intimidate, and harass me constantly. These are the people that our government is in bed with. It’s not only despicable for the horses, but it’s a industry full of shady people. The entire thing has got to go. Two friends also posted against horse racing at the Horse Racing Nation site, and ultimately all posts were deleted. Thank you everybody, not only for your support, but mostly for hanging in there for the horses, despite those who have intimidated, harassed, and put you down, etc., and perhaps even worse. Keep up the good fight for the horses and all those critters who cannot help/speak up for themselves, as I intend to do. Great respect, love, and hugs to all. Thanks Lucy for your encouraging words. We will continue to be a voice for the voiceless racehorses who are dying in the dirt. It is making an impact, and it will continue to open the eyes of our taxpayers, and casinos who continue to financially support this cruelty circus, and death camp. For example, the millions that is being skimmed off the top of casino profits going directly to the horse racing could be the millions going to infrastructure projects, and other things. People speaking out should change this, but it doesn’t always. 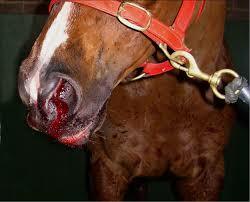 The horse racing industry is well-funded, and has paid mouthpieces including public relations firms.. They ensure that the never ending pot of money gets diverted their way while the majority of people (who don’t want to support this) get drowned out. It’s going to take a grass roots movement to educate, and it starts on this blog. Another thing, Joy is right when she advised not to engage with these pro-horse racing people. I have done it only because they state the most ridiculous comments that I’m compelled to set the record straight. However, they can’t dispute the essential elements of horse racing which is: beating/whipping, doping, dying, and dumping. This antiquated business model can’t exist without these elements, and it happens daily on racetracks, training centers, kill auctions, and slaughterhouses.